Our Upcycling taster workshop with learners at Scratch was so successful that it has been followed up with a four week course. Led by our tutor Gillian Jeffery our learners are finding out all about how to breathe new life into an old piece of furniture. Over the next four weeks learners will find out even more about some new techniques – from staining furniture to make it look as though it is antique to sanding down other pieces ready to improve their look. Learners are already commenting on how grateful they are to be given a place on the course. 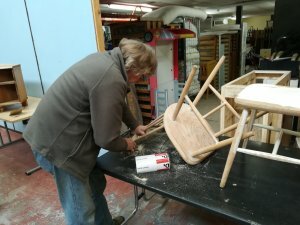 They are enjoying supporting each other in improving different pieces of furniture that will now be able to be sold or donated to people needing furniture to help set them up in a new home. This course may help learners to learn new skills with which they can start their own business. Recycling/Upcycling is very much in demand these days by Interior Designers as well as individuals simply looking to make the most of current trends and furnish their homes with bespoke furniture! SCRATCH provides services which relieve the effects of hardship, disadvantage and poverty for individuals and families living in Southampton and the surrounding area. SCRATCH relies on volunteers and donations to deliver its services, so please help us if you can. They are also always in need of furniture for the volunteers to upcycle so if you have anything you think may be of use please get in touch with them. We have provided funding for this course through our contract with Southampton City Council. Our contract allows us to support learners from the SO14 – SO19 postcode areas, particularly those who may be looking for work.